That being said, there are a few common “types” of cannabis that tend to have specific traits. 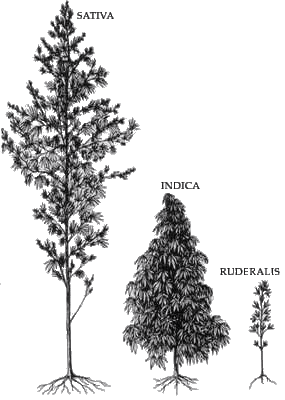 The most common types of cannabis you may hear about are indica, sativa and ruderalis (auto-flowering). Two Aurora Indica plants on left (very small, fast-flowering Indica) & Two Wonder Woman plants on right (a hybrid with some Sativa characteristics) – These were grown together from seed in the same environment yet you can clearly see the stark difference in growth characteristics between the strains! Very few growers have access to the genetics of “pure” Indica, Sativa or Ruderalis plants. These generally low-yielding ancestors of today’s popular strains are often far less pretty, medical and potent than strains which have been bred specifically for bud quality and yields. Example of “pure” Sativa buds – with older Sativa strains the buds are often loose and airy (though they can sometimes have unusual or unexpected effects!). Most modern strains actually hyrbids of many different strains that have been bred to produce higher yields, more compact buds, and be easier to grow indoors than what grows naturally outdoors! What is the Difference Between Sativa and Indica Strains of Cannabis?